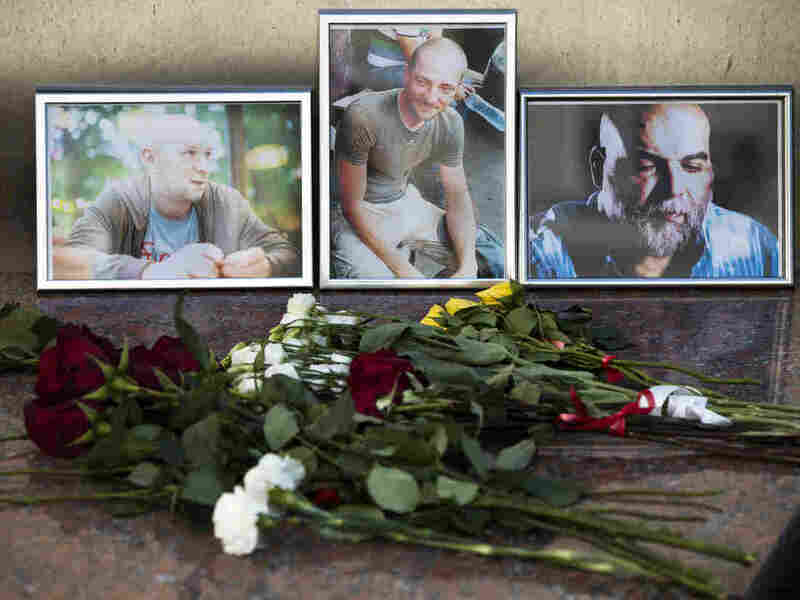 3 Russian Journalists Killed While Probing Reports Of Mercenaries In Africa Their vehicle was ambushed in the Central African Republic on Monday. They were hoping to shed light on reports of a private Russian military company fighting in the country. Three Russian journalists were killed in the Central African Republic while investigating Russian private military contractors and mining industries, their editor told media on Wednesday. Three Russian journalists were killed on Monday night in the Central African Republic as they were investigating a private military company with ties to the Kremlin. Acclaimed war correspondent Orkhan Dzhemal, documentary filmmaker Alexander Rastorguyev and cameraman Kirill Radchenko traveled to the country to make a documentary for a news website funded by Mikhail Khodorkovsky, an oil tycoon who was imprisoned in Russia and then exiled. They were hoping to investigate the Wagner Group, a shadowy mercenary firm. It is reported to have had military presence in Syria and was sanctioned by the United States last year for recruiting and sending soldiers to fight alongside separatists in eastern Ukraine. The journalists were also looking into Russia's potential interest in CAR's natural resources — diamond, gold and uranium mines, the Associated Press reported. The trio had planned to stay in the country for two weeks and entered on tourist visas, according to media reports. An editor who worked with them, Anastasia Gorshkova, told Russian media that a day before their deaths, the men had tried unsuccessfully to enter the area where they believed the mercenaries were staying. They were carrying expensive equipment and thousands of dollars in cash when their vehicle was ambushed near the town of Sibut, some 180 miles north of the capital, Bangui. Their driver, who survived the attack, spoke with the mayor of the town, Henri Depele, Reuters reported. "According to the driver's explanations ... armed men emerged from the bush and opened fire on the vehicle. The three journalists died instantly," the mayor said. Their expensive equipment was taken, but press cards and other possessions were left in the vehicle, a commander told The Associated Press. A CAR government spokesman said in a televised statement that they were shot by nine men who wore headscarves and did not speak in French or Sango, the two major languages spoken in the country, Agence France-Presse reported. "These were brave men who were not prepared simply to collect documentary material, but wanted to 'feel' it in the palms of their hands," Khodorkovsky said in a statement. "I hoped until the last moment that they had been captured, and that they could be rescued." He added that he would try to uncover their killers. Some colleagues have expressed suspicion that their deaths could have been caused by the sensitive work they were doing. In April, a journalist who was investigating Wagner's activities in Syria died after falling from his fifth-floor apartment in the Russian city of Yekaterinburg. Russian Foreign Ministry spokeswoman Maria Zakharova said at a press conference in Moscow on Friday that the three journalists were killed by robbers. A preliminary investigation revealed that they tried to resist their assailants, she said, according to Reuters. The Russian Embassy in the Central African Republic had not been informed the journalists were in the country, the Russian Foreign Ministry said in a statement on Tuesday. "Shocked and horrified by the news of a cold-blooded murder of 3 Russian journalists," the embassy tweeted. The Kremlin denies any links to Wagner. But the company's founder and leader, Dmitry Utkin, attended a Kremlin reception, Reuters reported in 2016. Utkin also worked as head of security for Russian oligarch Yevgeny Prigozhin, who has ties to the Kremlin and was indicted by special counsel Robert Mueller for interfering in the United States 2016 election. Earlier this year, Russia said that it sent 175 instructors to train CAR's military – at the request of the country's president.